MOREHEAD, Ky. — A federal judge in Kentucky has ruled that Kentucky clerk Kim Davis did not violate his order not to interfere with her deputies’ issuance of “marriage” licenses to homosexuals when she removed her name and other identifying information from the documents. After the high court opinion was issued in June, she was among those who refused to issue licenses—at least not with her name on them. Davis, who attends a Oneness Apostolic Pentecostal assembly, said that she would do so if her name was removed from the documents. 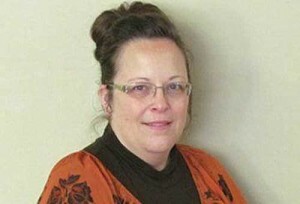 Her refusal soon went to court via a lawsuit led by the American Civil Liberties Union (ACLU), and in September, U.S. District Judge David Bunning ordered that Davis issue the licenses despite her religious identity. As she continued to refuse to issue the licenses, Bunning ordered that she be placed behind bars until she was willing to comply. In the meantime, the judge arranged for a deputy clerk to sign the licences in her absence. She was released from the Carter County Jail five days later after her attorneys filed an appeal of the contempt order, and also because Bunning was satisfied that her deputy clerks were providing the licenses instead. He stipulated her release on the condition that she not interfere with her deputies. When Davis returned to work days later, she announced in a press conference that while she would not stop her deputies from issuing the licenses, the documents would not bear her name. She issued new licenses that simply required the deputy clerk’s initials with a notarization stamp. The ACLU consequently filed a motion asking that Davis be found in violation of Bunning’s order not to interfere. “The adulterated marriage licenses received by Rowan County couples will effectively feature a stamp of animus against the LGBT community, signaling that, in Rowan County, the government’s position is that LGBT couples are second-class citizens unworthy of official recognition and authorization,” it said. In December, newly elected Gov. Matt Bevin issued an executive order allowing clerk’s names to be removed from licenses, thus granting Davis her initial request. On Tuesday, Judge Bunning ruled that Davis had not violated his order since “gay marriage” licenses are still being issued by Davis’ office and that the forms she utilized would still be considered by the state as valid. Some Christians have considered Davis’ move as a compromise that is not acceptable for one who professes Christ.